The 66th Madrid Derby at the Vicente Calderon was always going to be a special one, with Atletico Madrid having played their last fixture at their current home ground in the La Liga. The Rojiblancos will be playing at their new home ground, Estadio Olimpico de Madrid from the beginning of the 2017/18 season. 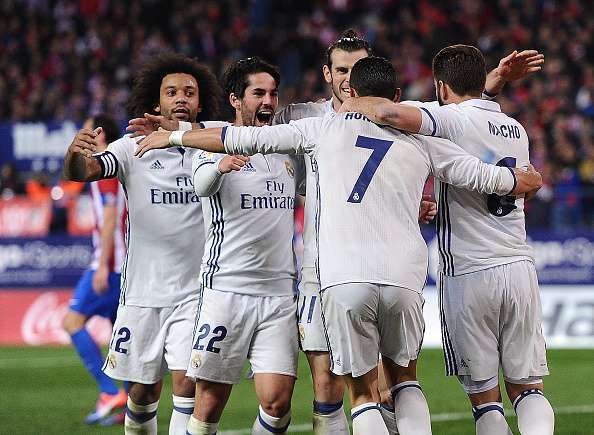 Atletico, who came into the match having not lost the last six league derbies against Real Madrid, had to leave disappointed as an out-of-form Cristiano Ronaldo found the perfect stage to silence his critics with an excellent hat-trick and thus give Real Madrid a thumping 3-0 win over their city rivals. The home side had the better start to the match as they attacked right from the word go. Real Madrid took some time to get settled, but Zinedine Zidane's tactics outmatched that of his counterpart's as his team executed his plans to perfection and handed their opponents their first Liga defeat at home in 23 games. Real Madrid's unbeaten start to the season continues as their lead at the top of the La Liga improves to four points, over second-placed. Diego Simeone's men have been struggling to adapt to their manager's new system and now languish in the fifth position, nine points behind Real Madrid following the derby defeat. The Slovenian keeper was unlucky to concede the first goal as the free kick deflected off one of his players, sending him the wrong way. He could not do much about the other two goals. Oblak made some vital saves early on in the first half to keep his side in the game at the break. The right-back had a decent first half as he kept Gareth Bale quiet much of the time. However, he was not able to provide much to his side going forward and was not able to supply crosses to his forwards. Savic had a game to forget as he was at fault for the first two goals. The free kick from Ronaldo was deflected off Savic's hips and although this might seem unfortunate, the centre-back, along with Gabi, should have been more disciplined in the wall. Savic also gave away a silly penalty in the second half, allowing Real to double their lead. An unimpressive performance from the usually reliable centre-back. Godin was not able to rally his troops, especially once Atletico's defensive cover, Gabi was taken off. The Brazilian was the best of the Atletico defenders as he was always available as an option to his forwards. Luis also made some important tackles and did not allow Lucas Vazquez much freedom. The midfielder failed to get involved much in the game. The only chance of note was when Saul almost converted Koke's lofted pass but failed to get the shot on target. One of the best players in a lacklustre performance by Atletico. Koke's display proved how useful a player he is through the middle. None of his passes and set pieces was converted by his teammates. However, the Spaniard did not contribute much defensively. The Atletico Madrid captain did not have a very productive game. Was taken off in the 62nd minute as a tactical change by his manager. 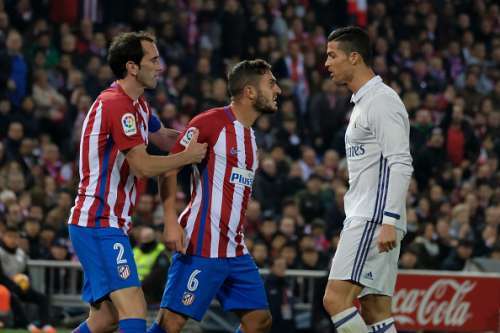 Gabi was partly at fault for the free kick scored by Ronaldo, as he along with Savic failed to maintain discipline in the wall as they left a gap that proved vital. Also received a yellow card for a rash tackle on Luka Modric. By far, Atletico's best player on the pitch. Carrasco was fearless, attacked the Real defence constantly and probably deserved a goal. But, some bad finishing and good saves kept him away from the goal sheet. Torres did not get many chances in the 61 minutes he was on the pitch. The Spaniard was not able to get much service and the one shot he had did not trouble the Real Madrid defence. Although the Frenchman had a silent first half, he had a bright start to the second half. 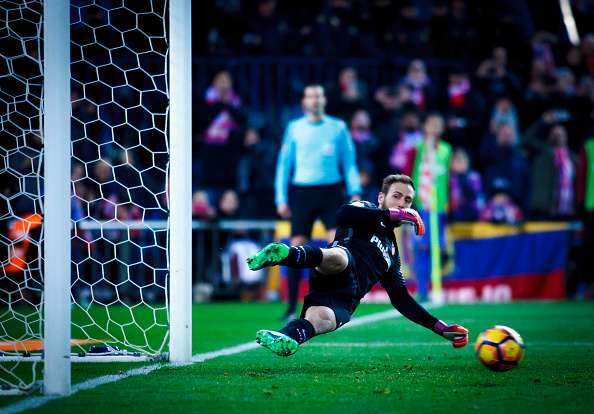 However, the final touch was missing from Griezmann's foot as he was kept in check by the impressive Real Madrid defenders. Correa came on for Gabi in the 62nd minute in what was a tactical change, with Simeone looking to add more firepower up front. The 21-year-old failed to add anything to the attack. Gameiro was also brought on in the 62nd minute to replace an ineffective Torres. The French striker, who has had a good season, was not able to change the rhythm of the match.